This can be a day of strong opinions and persistent ideas. We can be very shrewd and also insistent, and very focused on learning the truth of a matter. There can also be nice social opportunities emerging today. The Moon is in Gemini all day (until Thursday, April 23rd at 12:25 AM). The Moon is void from 1:37 AM forward (until tomorrow at 12:25 AM). 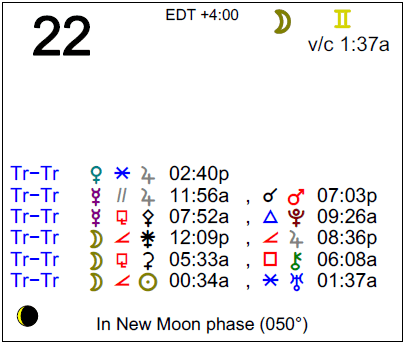 The Moon is in its New Moon phase until 12:36 AM / Waxing Crescent phase from 12:36 AM forward. This is a good day for coming to important ideas and strategies, Aries, and it also has some potential for feeling closer to people you care about. You might be especially interested in getting to the bottom of a matter. Problem solving skills are through the roof right now. You may be on the defensive or frustrated if your opinion or idea isn’t catching on, but if you avoid riling yourself up, you can channel all this mental energy into an important project. Financial and business matters fare especially well today. Enlist help and delegate if you can. While it’s a great idea to apply yourself to your work and practical problems, be sure to enjoy friendly moments with others as well. There is a somewhat competitive edge to the energy of the day, Taurus, and you might discover that part of this energy is something that you’re generating. In fact, you can be thoroughly excited by an idea or project now. Focus on improving rather than simply competing, and you will do very well today. You have vision and the energy to match, so try not to waste it on arguing a point. Your desire to build something solid in your life, to make plans for something long-term, is strong. You are particularly sharp and insightful, although you might be inclined to manipulate and persuade. It’s a fine time to focus on your own personal plans. Events occurring these days can challenge your perception of the world and your beliefs. Allow this process to happen – it’s evolution and it suits you well. Your natural charm is enhanced and noticeable today, Gemini. You are not only attracting admirers, you are drawing in positive circumstances and opportunities into your life. While you seem accessible today, there is a lot going on under the surface and behind the scenes. Your imagination and dreaming mind are especially active. There can be new, exciting developments in your private life. A seeming problem can end up turning around and in your favor now. You are dealing with ideas and concepts that you may have avoided in the past. Be careful to not only respect others’ limits, but also yours, as your curiosity can sometimes take you too far, learning of things you can’t unlearn. You may be supporting someone anonymously or simply from behind the scenes today, dear Cancer, making willing sacrifices, and feeling good for helping out. Your values are quite altruistic, as you are more concerned with contributing than scoring gains. Business matters can also thrive today, as there is a stronger ability to focus on what truly matters. You can feel very passionately about new ideas, or old ones that you’ve taken off the shelf and dusted off, and your visions of the future are sharp. While friendships can be helpful and teamwork productive now, there can also be some excitability and possibly even some form of rude awakening occurring now. However, any discomfort felt now is likely to disappear quite quickly as it leads you to better understanding and bigger opportunities. There could be opportunities for monetary or social advancement today if you look for them, Leo, and you could find that you’re especially popular now, both socially and professionally. With Jupiter in your sign, improvements come as a result of happiness with yourself, and are not the end goal. When improvements are the end goal, you are essentially rejecting who you are now, which can invite a belief that you’ve failed. Today’s Mercury-Mars-Pluto combination is powerful for problem solving, and is especially strong for career, work, and health matters for you. Be forthright, but sensitive to your audience as well. The urge to get to the bottom or heart of a matter is strong, but it’s important to know when you’re probing too deeply. You may be wanting to push the limits, and this can work to some degree today, but know when to stop. It’s a potentially privileged time for relating in healthy, inspiring ways, Virgo, but it’s important to know where to draw the line between professional and personal matters. Public image and professional endeavors can be quite favorable right now. You are especially sharp and insightful now, and this can be used to see what truly matters to you. Just be sure to pay extra attention to emotional cues when you’re relating with others socially. You can be especially excited about an idea or belief, and possibly a creative project as well. You can be excited to learn a subject more deeply. It’s an excellent time to pursue this kind of deeper study, and anything that involves healing the mind or paying special attention to the mind-body connection will appeal very strongly now. Friendships benefit from sharing of ideas, ideals, and encouragement today, Libra. You have more courage to express your deeper feelings, and you are in the mood for some romantic excitement and adventure now. It’s a good time to enjoy cultural or social events, trips, and educational entertainment. Even so, there is an edge to the day as you tend to want to get to the truth of a matter. Watch that you respect your own and others’ limits in the process. It’s a powerful time for dreaming up strategies to go after what you want. Both mental and emotional energy levels are high right now. Financial, real estate, and family matters can be in strong focus, and decisions and conclusions can be made now. Use your enhanced problem solving abilities to sort out tricky matters. This can be a good time for coming to important agreements with a partner, creditor, or debtor, Scorpio. However, there can be a part of you that is quite obsessed with an idea or a plan, and while this can be a positive thing if you channel the additional mental energy that’s with you today into something constructive, you may be coming on a little strong. The energy you invest in your work or important projects right now will return on itself, generating even more enthusiasm and passion for what you’re doing. This is an important time for knowing which ideas and projects truly move you, as well as learning what you are truly capable of doing. You can experience today’s energy through a partner or significant friend, as someone may be very intent on getting under your skin or could be trying to turn you on to an idea or plan. You are coming across very well today, Sagittarius, and you may be feeling especially open and generous, which further endears you to others. Work and health continue to be big themes right now, and the pace is certainly picking up around you. You could become inflamed with the desire to sort out problems and get your daily life and work into top order. This can also be the case for your health. Try to avoid sharpness with others, and instead use the extra mental energy generated today towards tidying up an important area of your life. Be sure to come up for air from time to time, as the social atmosphere around you is good today, but do take advantage of your special ability to get to the root of problems. You are more confident and focused than usual today, Capricorn. Your natural talents are a little more obvious and attractive, and while your desire for entertainment is pronounced, you’re also focused on getting something done. Your ambitions are to the fore. You can experience a strong urge to express yourself in a creative, unique manner. Decisions tend to be sharp and come rather quickly, but could be lacking an emotional element. Decisions made now tend to revolve around love relationships, entertainment, and children. You’re energized right now on a mental level. As long as you avoid rash impulsiveness and an overly competitive disposition, you’ll do well. You can be in an indulgent mood on one hand, Aquarius, and business-minded on the other right now. Take advantage of the extra energy you have now by pouring it into something constructive or physical. Family life can be animated or your own inner world can be especially rich and exciting. There can be vivid memories and important discoveries. You could be revisiting an area of your family life or past that seems to engage your attention now. Relationships are taking on special meaning and new “layers” – you have special insight into patterns of relating and people you love. While there can be a strong internal focus, you are also especially attractive to others today, making it a good time to spend at least some of your day with others. There is a lot of mental energy to deal with today, Pisces, and for the most part, you’re channeling it well. Whether you’re teaming up to get something done or simply applying yourself to a pet project, you’re passionate about what you’re doing and quite good at it to boot. Debate, share your ideas, and engage in mental gymnastics, but keep your emotional distance for best results. Ideas are all-consuming and exciting. There can be some impulsiveness, but overall, you are wise enough to see that working with a strategy benefits you the most right now. When it comes to work and family, you’re in a good place, and sharing humor and possibly even some of your burdens with the people closest to you can be especially helpful now. If Your Birthday is April 22nd, If Today is Your Birthday full horoscope here. We may have some difficulty letting go of hurt feelings or resentments. We can be sensitive to what others think of us, and decisions made now may not reflect our hearts, and can be regrettable later on. We might take things the wrong way due to sensitivity. We may not make efforts to be understood. Hurt feelings are opportunities for healing. Now is the time for building bridges, not burning them. There can be mental tension and disorganization, making this a difficult time to get a clear message across. A good time to expand our connections, contacts, creative pursuits, romantic relationships. There is more generosity and good will in our relationships. We might be more inclined to indulge, shop, socialize, and enjoy ourselves. Follow your bliss. Now is the time to discover your true heart’s desire. This could be a person, a vocation, or an artistic hobby. You have a basic need for mental stimulation. You are curious and seek answers to many questions. You are a chatterbox. When young, you may have called upon your mother to provide stimulation and activity. You are a suffering and wounded person. You feel that you are misunderstood, particularly by your own mother. Once you have learnt to rise above your pain, you will have the ability to understand and help others. Sabian Symbol: Steps up to a lawn blooming with clover. You have difficulty adhering to rules and regulations in your life. You need to make adjustments so that you can incorporate reasonable structures. You have many so many ideas and plans that you are not sure which ones to follow. You make promises you can’t keep, although your intentions are good. You have a probing mind and an ability to assess situations rapidly. Your words are straight to the point. You enjoy delving beyond the superficial. Sabian Symbol: World famous pianist giving a concert performance. You have the ability to set goals and reach them with the help of your loved ones. You are idealistic and unrealistic when it comes to personal relationships. Consequently you often feel disillusioned and sorry for yourself. You blame others for their perceived lack of understanding. You need to develop a healthy respect for yourself and others based on realistic expectations. You have strong personal desires, although you will usually follow a reliable course of action in attaining those desires. You are stubborn if opposed. Sabian Symbol: A symbolical battle between `swords’ and `torches’. You need to spend a lot of time developing self discipline as your impulsiveness may be an impediment to reaching your goals. You have a high energy level and a call to right the wrongs you see around you. Sabian Symbol: An old sea captain rocking on the porch of his cottage. Sabian Symbol: A little child learning to walk. Sabian Symbol: Glass blowers shape with their breath glowing forms. Sabian Symbol: A clown making grimaces. You are apt to become stuck in your ways and oppose change. You prefer the comfort and safety of things known to the insecurity of the new. Sabian Symbol: A canoe approaching safety through dangerous waters. Cnj 09°Cn19 ALHENA To have a mission; creative. Sun 03° Taurus 57' 37"
Moon 06° Capricorn 03' 09"
Mercury 09° Aries 38' 26"
Venus 04° Aries 33' 07"
Mars 15° Gemini 54' 03"